Looks like the blu-ray release of yet another highly-anticipated catalog title has met the "cancelled" monster. 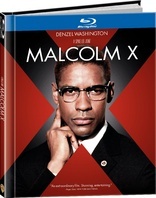 Warner Home Video says that the scheduled blu-ray release of the Spike Lee biopic, Malcolm X, has been cancelled because of issues involving music rights for certain of the film's songs. What a shame, as it was announced last September that the film was slated for a January 25 release and was to be presented in that ultra-cool Digibook packaging. We had our eyes on this one. No word yet on a re-release date, but using the word "cancelled" instead of "delayed," as they have in the past, is not a good omen. And thank heaven they didn't decide to over-dub with alternate tracks, as many distributors have done with some TV releases of late. Stay tuned though, as Warner says all parties are working diligently to resolve the issue. Fingers crossed and hoping the stated reason is the real reason. Music rights issues can be worked out. But many titles recently have been getting the delay or cancellation because the distributors aren't sure there's any money to be had with catalog titles in the blu-ray format. Those reasons are hard to work out.